Patience is a virtue for REIT investors. After three years of stumbling stock price performance, REITs have surged out of the gate in 2019, boosted by receding interest rates. The REIT rejuvenation appears to be on solid footing from a fundamental perspective, as valuations remain reasonable. REIT metrics bottomed in 2017 and gradually improved through 2018. After the nearly 20% jump, REITs are no longer trading at an NAV discount, but that’s a welcome relief. The acquisition pipeline could re-open this year as a result. Faced with a challenging acquisition environment, REITs have focused more on new development. 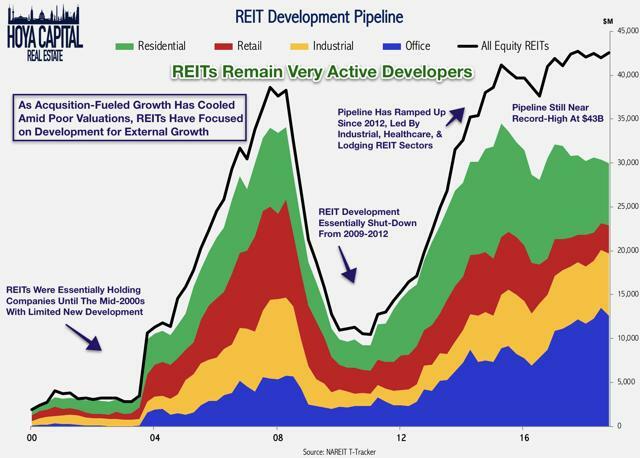 REITs have become some of the most active builders in the real estate industry. REIT balance sheets are as solid as ever, calling into question the warranted degree of interest rate sensitivity. We analyze REIT fundamental data from the recently released NAREIT T-Tracker data. 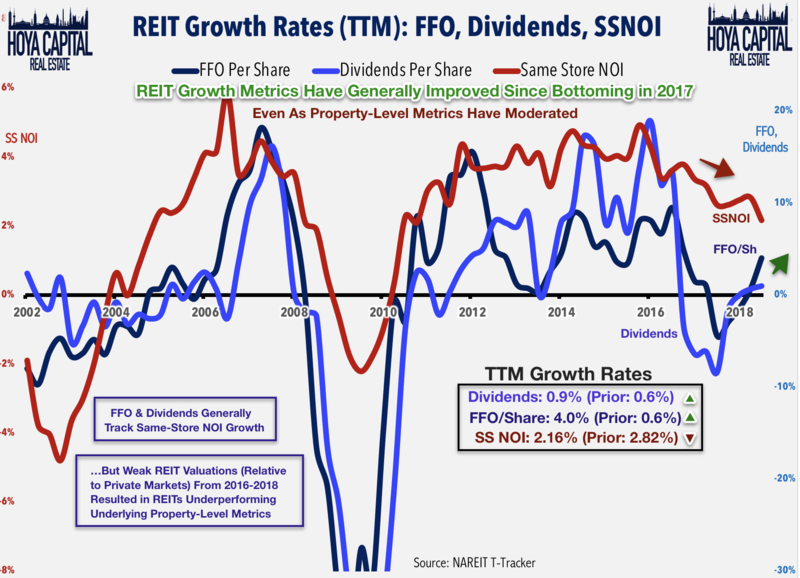 As REIT stock valuations continue to trade at the mercy of macroeconomic forces - namely interest rates - it's easy to lose sight of the underlying property-level fundamentals. 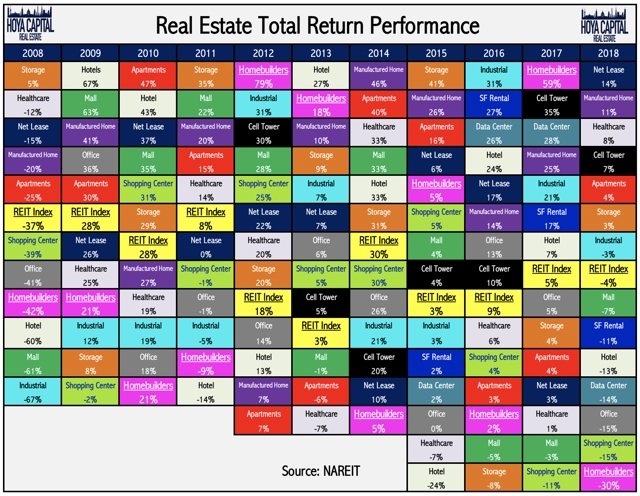 In this report, we analyze the recently released NAREIT T-Tracker data to review REIT fundamentals and analyze what they could mean for the rest of 2019. Beneath the interest rate-driven market swings, REITs quietly delivered a solid year in 2018 from a fundamentals perspective. Growth metrics inflected higher and generally rose throughout the year, after bottoming at the end of 2017. For full-year 2018, REIT FFO/share rose by 4%, after declining by a similar magnitude in 2017. Dividends per share also rose by 1%, after dipping by 8% in 2017. 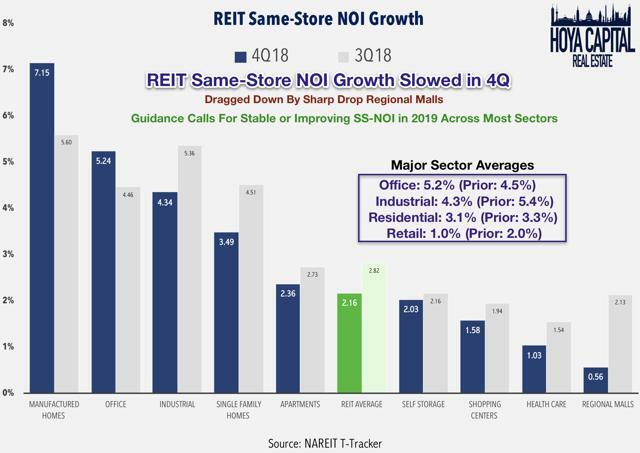 After climbing through much of 2018, however, same-store NOI ticked lower to 2.16%, dragged down by a particularly poor year from the mall REIT sector. As frustrated as REIT investors get with the "Rates up, REITs down" paradigm, at least we can take comfort in the fact that the opposite has been true since late 2018. Interestingly, REITs defied the paradigm for much of 2018, before snapping back to the trend line late in the year as 10-year treasury rates took a leg higher to 7-year highs in October. 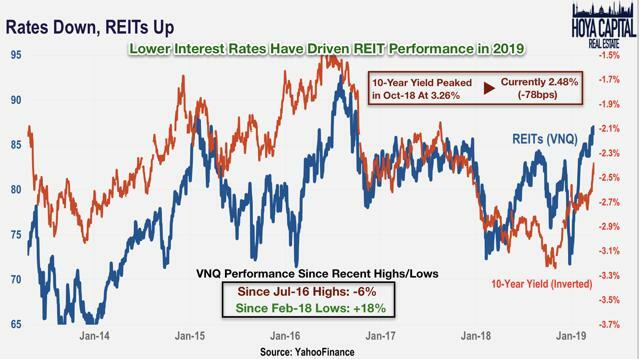 Since bottoming in late December 2018, REITs (VNQ) have jumped nearly 18%, corresponding with an 80-basis point decline in the 10-year yield. Equity valuations play an important role in the underlying operating fundamentals of the REIT business, particularly for REITs that have historically relied on their NAV premium to fuel external growth through acquisitions. The recent surge in REIT shares has finally pulled the sector out of "REIT Purgatory," the persistent Net Asset Value discount that has encumbered the sector for all of the past two-plus years. This NAV discount - indicating that assets held within REITs are implicitly less valuable than the same assets held by private companies - has made it all but impossible to accretively grow through traditional acquisitions. 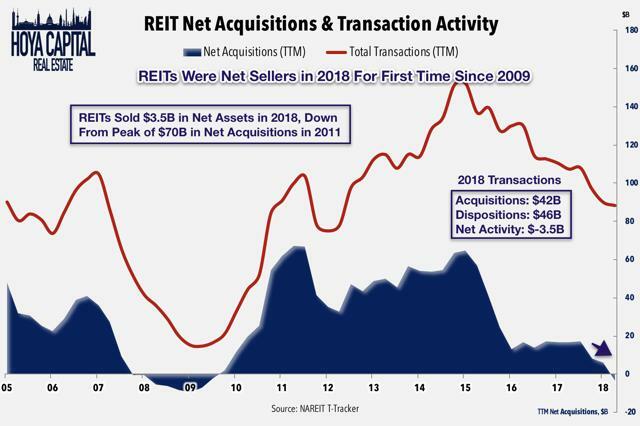 Illustrating this challenge and its implications, REITs were net sellers of assets in 2018 for the first time since 2009. 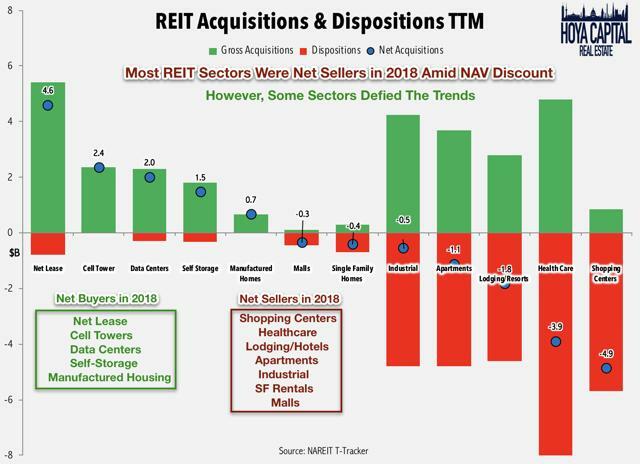 REITs, on average, are now trading at roughly NAV parity with many sectors trading at sizable NAV premiums, which should open accretive acquisition opportunities that didn't exist just three or six months ago. 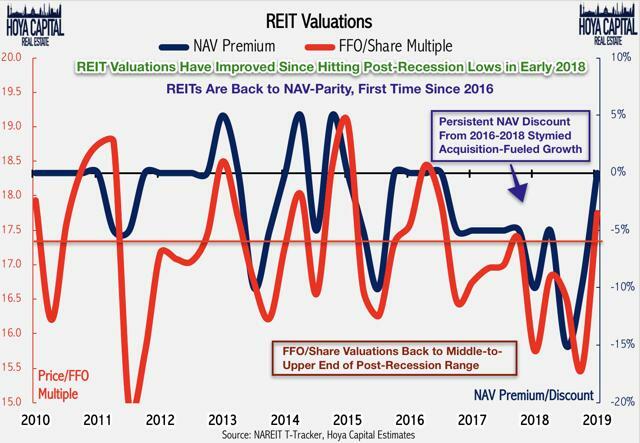 After hitting the lowest valuations of the post-recession period in late 2018, REIT FFO valuations are now trading slightly above the post-recession average. According to T-Tracker data, the average REIT FFO multiple hit 15.5x at the end of 4Q18, the lowest since 3Q11. With a more than 15% jump in valuations so far this year, we estimate that the average REIT FFO multiple was roughly 18x at the end of 1Q19. REITs are no longer simply buy-and-hold real estate holding companies, however. Before 2005, only a handful of REITs had in-house development teams, but that has changed significantly over the last decade, and a half as many large REITs are among the most active real estate developers in the country. Fueled by firm private market values, development yields remain attractive in many sectors, though these yields have shown signs of compression in recent quarters as costs rise and cap rates have softened slightly. The development pipeline remains near a record high at $43 billion, exceeding the 2008 peak of $38 billion. The industrial and residential sectors pipelines remain full, while the retail sector continues to see only modest redevelopment and almost zero new development. Same-store NOI growth remains strongest in the manufactured housing, office, industrial, and single-family rental sector. 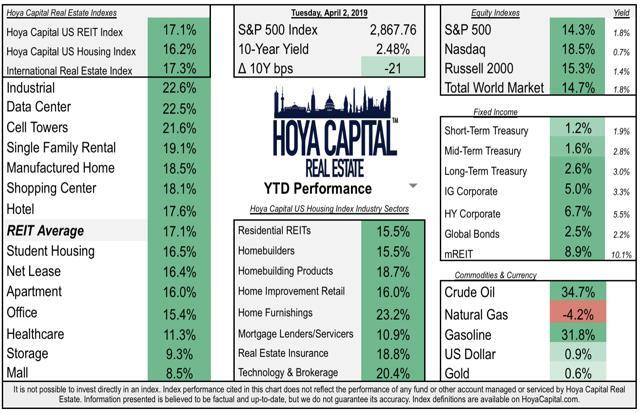 Classic late-cycle outperformers from an NOI perspective, office REITs continue to see an impressive jump in same-store metrics, one of just two sectors that saw improving growth in the fourth quarter. 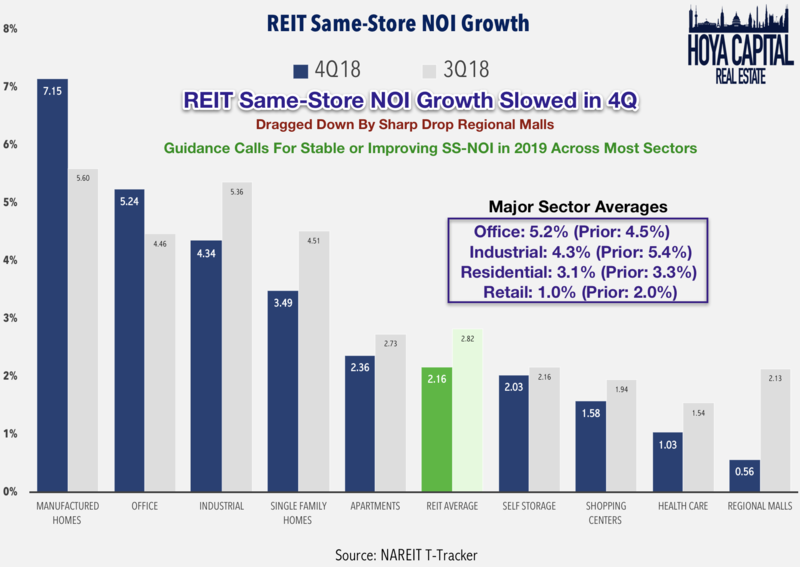 A sharp drop in mall REIT same-store NOI growth was largely responsible for dragging down the broader REIT average from 2.8% in Q3 to 2.2% in Q4. Occupancy rates remain near record highs, no doubt helped by the continued trend of "portfolio recycling" of selling low-occupancy assets and acquiring higher-occupancy replacements. At 93.8%, average REIT occupancy declined slightly from the record-high level of 94.2% last quarter. 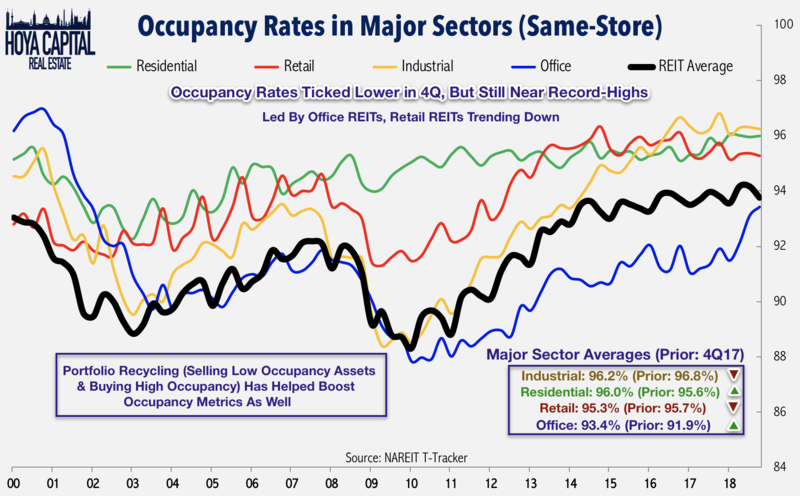 Residential and office REITs reported higher occupancy compared to 4Q17, while industrial and retail REITs saw slight declines in occupancy. As discussed above, the REIT sector as a whole has seen limited net acquisition activity over the last year, but several sectors remain quite active given their favorable cost of capital. The net lease, cell towers, data center, and self-storage sectors combined to acquire more than $10.5 billion in net assets in 2018. By comparison, shopping centers, healthcare, and hotel REITs sold a combined $10.5 billion. At the share price level, the e-REIT sectors (industrial, data centers, and cell towers) have led the way, each climbing more than 20% so far this year. The gains have been broad-based, as all fourteen commercial REIT sectors and all eight housing sectors are higher by at least 8% so far this year. Looking at sector returns over the past decade, we note several interesting trends. Manufactured housing has outperformed the REIT average for six consecutive years, while malls and shopping centers have each underperformed the averages for each of the past three years. After getting punished by excessive leverage during the financial crisis, REITs have been exceedingly conservative in the post-recession period. This diligent balance sheet management has positioned REITs exceedingly well relative to highly levered private equity competitors in the event of a sustained slowdown in fundamentals or near-term dislocation. Debt accounts for less than 35% of REITs' market value of assets, down from an average of roughly 45% in the pre-recession period. EBITDA coverage ratios were approaching 5x by the end of 2018, compared to the sub-3x average in the pre-crisis period. As a percent of NOI, interest accounts for less than 25%, the lowest level on record. As more REITs have obtained investment-grade bond ratings, they have been able to issue longer-term unsecured debt, pushing the average term to maturity on debt to more than 6 years. 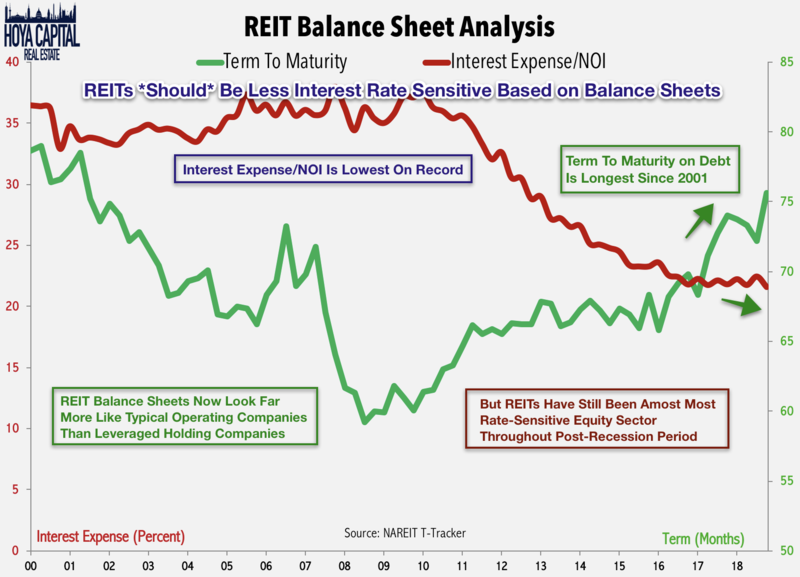 Curiously, REITs have become increasingly more interest rate-sensitive in recent years, despite the fact that the liabilities side of the REIT balance sheet is largely indistinguishable from a typical S&P 500 component. As we point out, however, rate sensitivity is "in the eye of the beholder," meaning that while REITs are indeed quite rate-sensitive compared to other equity sectors, REITs are certainly less rate-sensitive compared to long-term bonds. 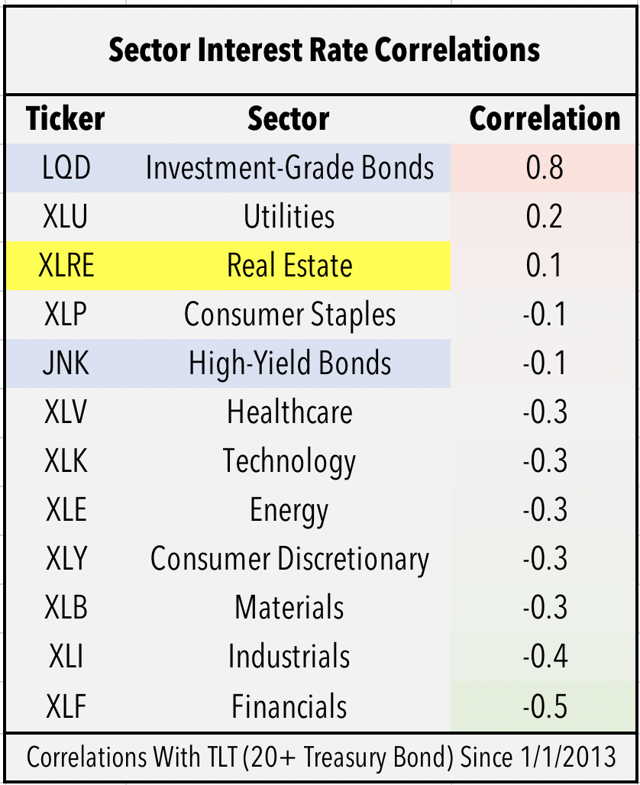 Looking at correlations with long-term Treasury yields (TLT), the Real Estate Select Sector SPDR ETF (XLRE) is the second-most rate-sensitive equity sector. Patience is a virtue for REIT investors. After three years of stumbling stock price performance, REITs have surged out of the gate in 2019, boosted by receding interest rates. 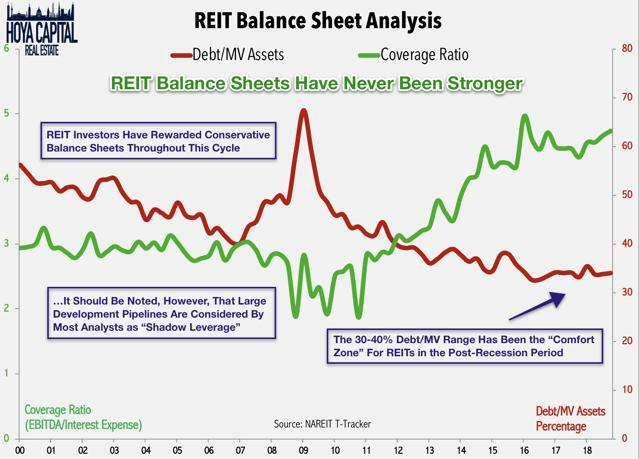 The REIT rejuvenation appears to be on solid footing from a fundamentals perspective. REIT metrics bottomed in 2017 and gradually improved through 2018. After the nearly 20% jump, REITs are no longer trading at an NAV discount, and that’s a welcome relief. The acquisition pipeline could re-open this year as a result. Faced with a challenging acquisition environment, REITs have focused more on new development. REITs have become some of the most active builders in the real estate industry. REIT balance sheets are as strong as ever, calling into question the degree of rate sensitivity implied in the public markets. We analyze the recently released NAREIT T-Tracker data. If you enjoyed this report, be sure to follow our page to stay up-to-date on the latest developments in the housing and commercial real estate sectors. For an in-depth analysis of all real estate sectors, be sure to check out all of our quarterly reports: Homebuilders, Net Lease, Data Center, Manufactured Housing, Student Housing, Single-Family Rentals, Apartments, Cell Towers, Manufactured Housing, Malls, Shopping Centers, Hotels, Office, Healthcare, Industrial, and Storage. Disclosure: I am/we are long VNQ. I wrote this article myself, and it expresses my own opinions. I am not receiving compensation for it (other than from Seeking Alpha). I have no business relationship with any company whose stock is mentioned in this article.